saying, "I will try again tomorrow." Remember, we 100% guarantee everything we sell. If you ever decide you don't like our products, just return it withing 90 days of purchase, and ask for your money back. Once you place your order via our secure server, you'll be able to download the audio training program and special report right away, and the workshop, teleseminar and speech will be sent to you within just a few days. So, are you ready? 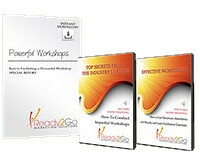 Order today so you can begin implementing your very own multi touch marketing strategy to explode your business! P.S. Our introductory offers are available only for a limited time, so be sure to lock in your special pricing today.